Before we had kids, my husband and I would wander through boutiques and admire children’s toys. We were certain our someday playroom would house a toy chest filled with wooden toys, black apple dolls, handmade goodness and vintage finds- none of that plastic-y, character-y junk. Now that we have kids, the price tag of said toy chest is enough to deter us from making that a reality. However, I still love the idea of having a vintage-y baby buggy. So I rounded up a dumpster-bound broken stroller, a basket we’d acquired on a recent trip to our local apple orchard, a table runner and placemat that haven’t made their way to my table in awhile, and went to work. This lovely little pram is the end result of my toils. It is the perfect spot for a baby doll to rest her head on a once-placemat pillow and snuggle under a formerly-table-runner blanket (black apple dolls welcome but not required). Additionally, it is tough enough for the wear and tear of real kids, entirely upcycled and FREE! Now, if only I could somehow dissuade them from their twin affections for Barney and toys that make obnoxious beeping noises, we’d be good. -a toy stroller- if you don’t have one, these can be found in great abundance at thrift stores. 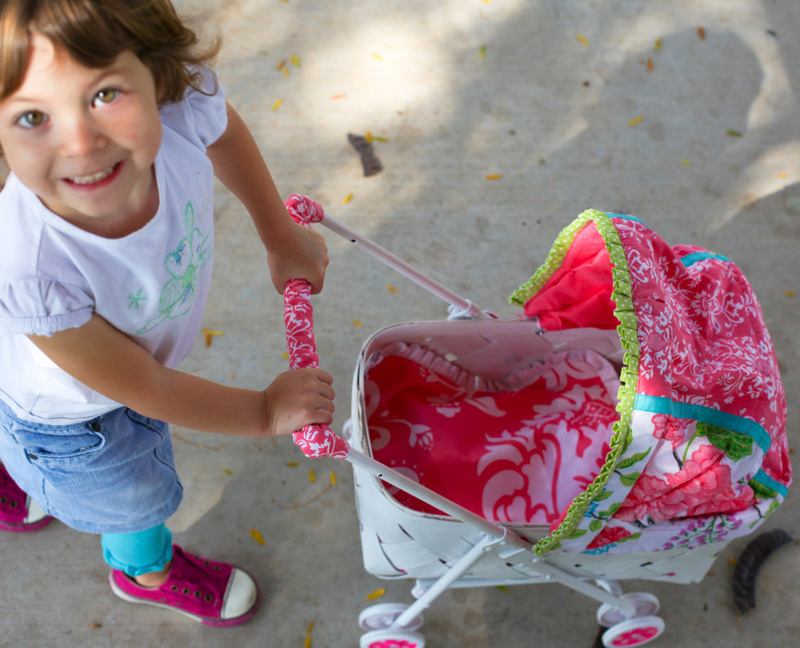 -a basket that fits snugly between the stroller’s handle bars. 1. Discard the stroller liner. With a saw, remove the cross bars on the back of the stroller and the two rods that serve as the “seat” of the stroller. Keep one of the long cross bars to re-use as a handle bar later. Remove handle bars. 3. Spray paint the basket, stroller and handle pieces. Let dry completely. 4. To secure the basket to the stroller, place basket into the stroller frame. Mark the middle on the metal bar of stroller frame and the place where it lines up on inside of the basket. Drill a hole through the metal rod and the side of the basket. Secure the basket and stroller together using a screw, a nut and a washer. If you feel like your basket isn’t secure enough, you can also drill holes and secure the bottom of the basket to the bottom of the stroller frame. 5. To create the long handle bar, measure the length between the bars and cut a piece of metal to fit between them. 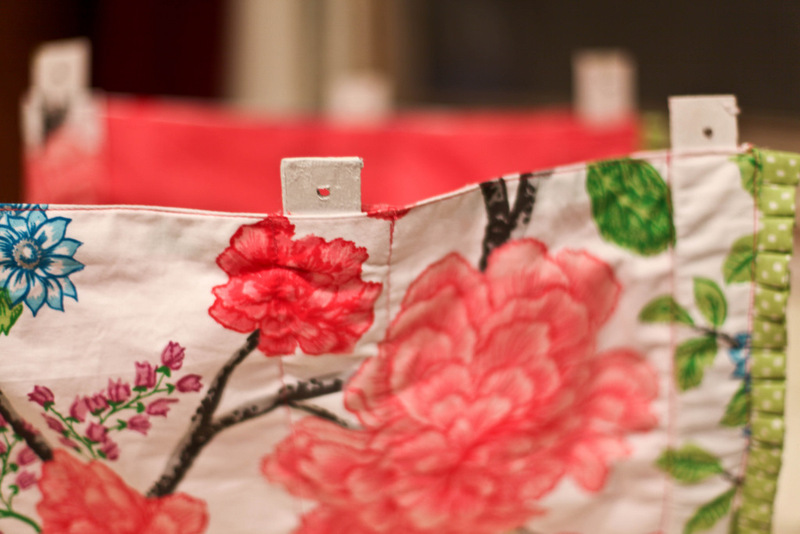 Create a tube using a scrap of the table runner fabric. Place the fabric tube onto the metal bar. Screw the new handle into place using a screw and nut. Pull the tube of fabric over the ends, to hide the screws. Note: The hood measurements are based on the basket and handles I had. You may have to adjust accordingly. 1. Cut the table runner in half. Match the finished edges together. Seam rip the inside seam of the table runner (the two seams facing each other) and re-sew the pieces together to create one piece of fabric. Measure out so that the fabric is roughly 21 inches from top to bottom and cut off the remaining fabric. The finished piece should be roughly 21 inches long and 28 inches wide. 2. Mark 2 inches in from the top edge and 4.5 inches in from the bottom edge. Fold in fabric half (length wise) to find the center and mark 1 inch from each side of the center. 3. Finish the bottom edge by folding and ironing a 1/2 inch seam and then folding and ironing again to create a 2 inch tube. Sew on the inner edge. This tube will encase one of your handles. 4. Sew on the other marks (the width of the fabric) to create two more 2 inch tubes… these tubes will encase your handles and give shape to your hood. 5. If you are using the old handles of the basket, drill holes into each end of handles. Feed the handles through the tubes in the table runner fabric. You should have three handles threaded through 3 tubes. (if you cannot use the handles, wire from a hanger will work as well- though, you may want to decrease the size of the tubes). 6. Gather all three handle ends together and attach to the middle of the stroller with a screw and bolt. Repeat on the other side. 7. There will be a lot of loose fabric where the handles come together. Tuck the loose fabric into pleats and hand sew to secure. For me, this took a lot of fiddling with the fabric until it looked right and felt secure. 8. 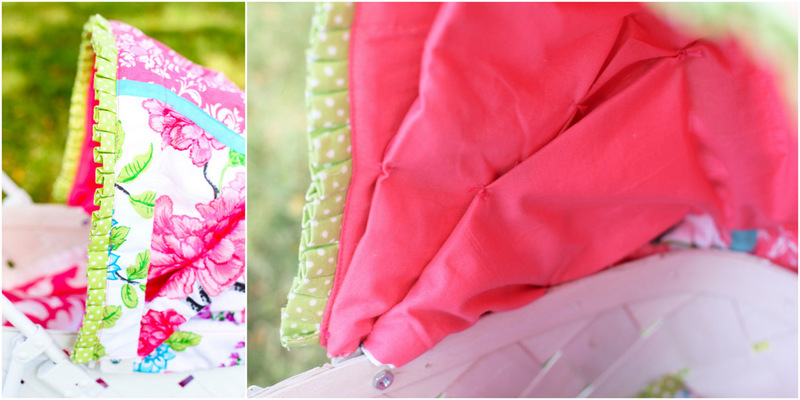 Use the left over scraps of fabric to make a baby pillow. I found a matching placemat and made it into a baby quilt as well. 9. You’re finished! Give this buggy to an admiring toddler. Just fyi, my girls L.O.V.E. this buggy. They played with it for hours when I first gave it to them and it is still the most fought-over toy in our playroom. 🙂 With two daughters and another one on the way, we may just have to make more of these!